This management book is published in association with the Institute of Leadership and Management (ILM). Drawing upon both contemporary experience and that of well known leaders, this book offers practical advice and guidance to inspire, encourage, and inform anyone facing, for the first time, the real day to day challenges of leadership. Over recent decades technology and education have led to great challenges for traditional styles of leadership. Nevertheless, the author demonstrates real prescience in ancient tales of leadership, its initiation and development and their practical value for leaders today. The book opens with the author’s account of his own initiation into leadership; of being propelled totally unexpectedly and quite unprepared into the practice and challenges of leadership. 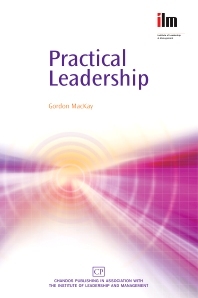 The book contains reflections on and fundamental insights into the nature and practice of leadership. Illustrated with many rich examples, metaphors, allegories and illustrations, the author exposes consistent patterns marking the practice of great leaders. Initiation: Of mentors, meetings and missions (seemingly) impossible! ; Into the unknown: First steps in leadership; Turning a crowd into a team; Driving change; The constraints of leadership; The unforgiving minute: From busyness to working smart; Touching base: It’s good to talk; Storms of passage: Leading through conflict; Landfall and reflections in still waters; Epilogue. Gordon MacKay holds BA and MBA degrees and has been involved in both strategic consultancy and as a ‘hands-on’ project manager. For over twenty years, the author has developed and continues to refine his leadership competencies. He has also developed significant skills as Assessor Mentor for the National Vocational Qualifications Programme for Senior Management. Through the events described in this book he won special recognition for a ‘turn-round’: leading over a thousand staff to award of ‘Best UK Call Centre’, as externally assessed.